Transportation, urban planning, and local economy are important aspects of life everywhere, and Ottawa is not an exception to this. Improvements help enhance quality of life for residents, visitors, and tourists. Accessible transportation options help reduce congestion in big cities and allow people to move freely, whether for business or leisure. There are things to be done in Ottawa to this end, like better network planning and improved bus service. The goal is to develop and maintain an affordable, reliable, and effective transportation system for everyone. Improvements also mean better safety and security and punctuality. In addition, higher volumes of transit ridership also help reduce pollution and improve air quality. Pathways and sidewalks help improve infrastructure and quality of life in the big cities. The same goes for amenities at intersections to make them more accessible and safer for pedestrians. Policy makers focus on several areas to improve efficiency, travel times, and other aspects related to transportation. These include parking at major and busy locations, adequate locations for bus stops, construction of more train and bus stations, and better road infrastructure when it comes to signaling and signage. Improvements could be done to enhance amenities such as bike lines, shelters, lockers, and cycling infrastructure in general. Other amenities include garbage cans, public restrooms, lighting, benches, and more. It is also important that decision makers and other stakeholders develop strategies to encourage residents and visitors to use bus, train, and other means of transportation. Safety education is also a priority, especially for children and teenagers. There are different ways to achieve this, including awareness raising, campaigns and public education, outreach, and others. Employee travel plans also encourage commuters to use public transport. All of these require expert analysis, detailed marketing and financial plans, and a skilled labor force to implement them at the local level. The goal is to reach a 50:50 ratio between car traffic and more eco-friendly modes of transportation such as car pooling, cycling, walking, and public transit. When it comes to urban development, Ottawa has underwent considerable transformations in light of the fact that light rail transit is about to begin operation for visitors and residents. Light rail transit is expected to change the cityscape. Major redevelopments are also underway, including the shopping centers at Westgate and Lincoln Fields, Tunney’s Pasture, Oblate lands on Main Street, the Forces Base Rockcliffe, and LeBreton Flats, to name a few. This is good news for residents as quality of life is of particular importance. The reason is that residents retire earlier and often have better government pensions. They also have plenty of time to have fun and spend. This is why quality of life matters. The cityscape is changing and evolving, partly explained by population growth. In fact, by 2019, Ottawa’s population is expected to hit 1 million. The city grows at a faster pace than the rest of Canada and as we all know, it is citizens who transform the cityscape, especially young people who come to live and work in Ottawa. Light rail transit is expected to play an important role in light of population growth. When completed, about 70 percent of residents will be able to reach a station within 5 km. Moreover, light rail transit will have a profound effect on major downtown streets in Ottawa. At present, there are some 1,500 buses running on Albert and Slater Street. This number will go down to close to zero at some parts of Albert Street and about 400 a day running on Slater Street. The number of buses on Wellington Street and Rideau Street is also expected to drop significantly. The local economy is also expected to grow, mainly because of influx of people and population growth and the significant construction activity already underway. The expected growth for 2017 is 2.2 percent. The growth rate was higher only in 2010 (2.9 percent GDP growth). This is good news given the fact that economic growth slowed down to 0.5 percent a year because of federal layoffs in 2012, 2013, and 2014. In 2017, growth is fueled by non-residential construction such as major renovation and the light rail project. Tourists visiting the city also help revive the local economy. 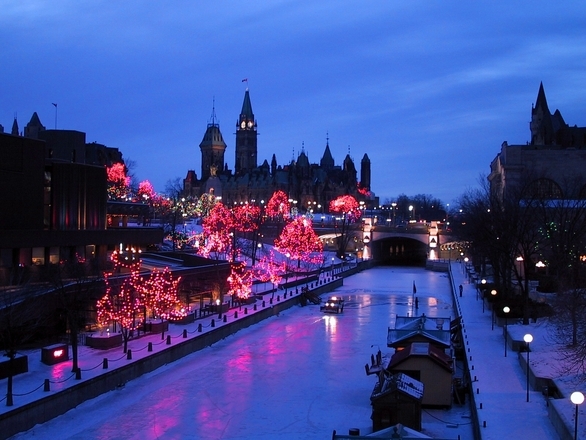 According to experts, visitors will grow by 125 – 150,000 this year, spending additional $50 million in Ottawa. Ottawa Housing Market – Is Borrowing Large Amounts of Money to Get into the Housing Market a Bad Idea?